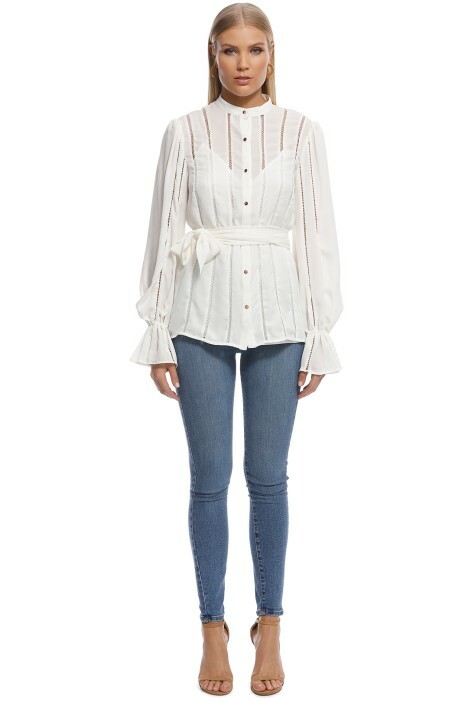 Freshen up this season’s wardrobe with this white top by Keepsake the Label. Featuring a high neckline with a button through front and balloon sleeves with elasticated cuffs. With lattice trims throughout and a detachable waist tie for a cinched look, rent it for a work function or for date night. Pair the top with high-waisted pink shorts and hire a gold mesh foldover clutch for a date night look. Check out our blog and get inspired by our post on date night makeup ideas! All product listed are in Australian sizes. Model is wearing size 8. Model is 177cm / 81cm-Bust / 64cm-Waist / 89-Hips. GREAT FOR: Pear, Petite, Straight body types.